NOT a day goes by without some EPO scandal (large or small). It’s like watching the ‘action’ on the deck of the Titanic while worrying for the fate of helpless passengers aboard. Because it has nothing to do with “technology transfer” — whatever exactly that means (it usually gets used as a euphemism for “licensing”, amicable of coerced for). They did that for a fee, or with direct support from the EPO. 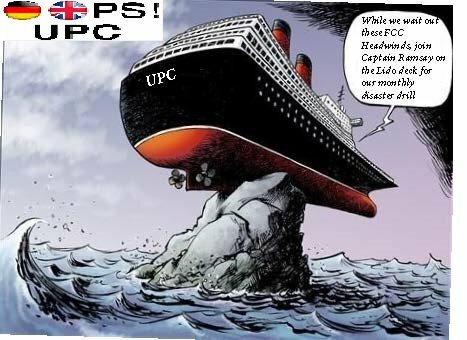 The chief economist of the EPO seems like an old French mate of Battistelli and we have repeatedly caught him lying about the UPC. What we see here is the EPO basically wasting a lot of money. It’s paying to produce pro-UPC lies and frame these as scholarly. Stakeholders’ money well spent? Of course not! And worse — it corrupts academia just like the EPO corrupts European media. “What we see here is the EPO basically wasting a lot of money.”Shame on WIPR for being a mouthpiece for the EPO on this. As far as we can tell, it’s the only publication (so far) that amplified the above. Knowing a little about WIPR inside affairs, I am not at all surprised by this. The publisher actively tried to suppress if not spike some articles that revealed the ugly truths about the EPO. See the comments on the corresponding tweet. EPO insiders have beaten me to it, seeing that WIPR is even quoting Benoît Battistelli directly from the press release (it can be found here). It’s almost as though journalism is dead and investigation/fact-checking is actively discouraged. Money (income) is in lying for the EPO now that Battistelli feeds some ‘parrots’ off his palm. He does not use his own money but EPO budget. He scatters it to the wind while lowering everyone’s salary but his own (and his cronies’). If Eponia was really a country, Battistelli would be accused of treason.